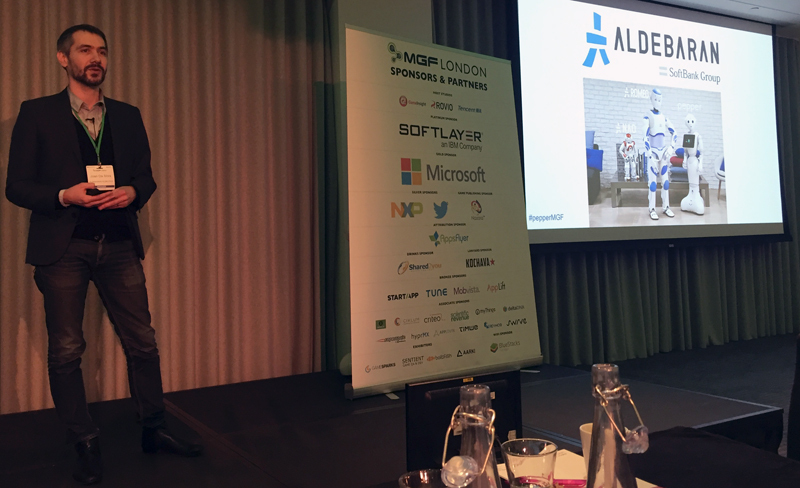 火, 02/02/2016 - 14:16 Elise D.
For the second year, Aldebaran attended the Mobile Games Forum, held on January 20th and 21st during the London Mobiles Game Week. For its 13th event MGF gathered together various game developers and publishers as well as platform and service providers. Over the course of the two day event, the trends and best practices of the mobile games industry were discussed and highlighted. 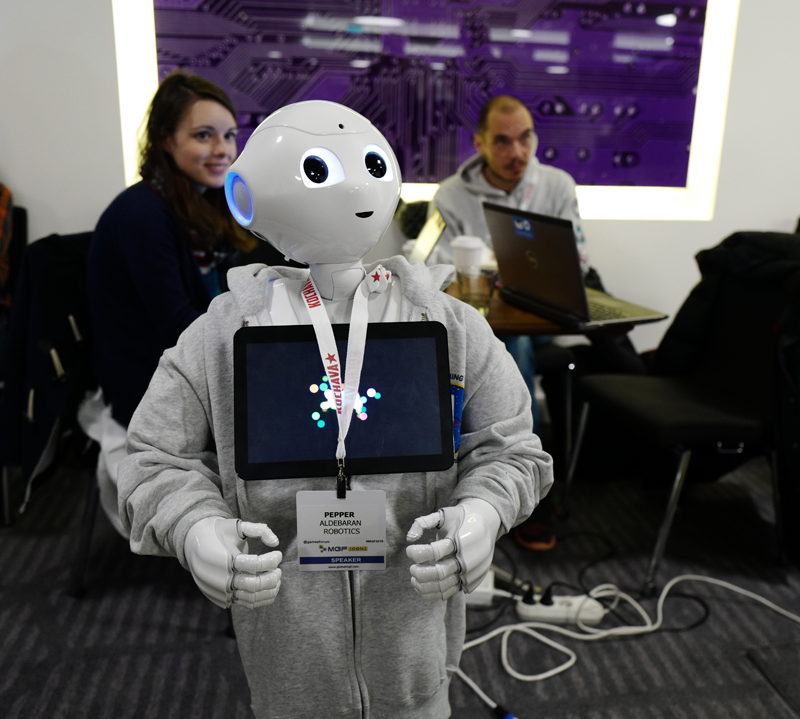 Among the most innovative devices and games, we decided to introduce Pepper, our special guest, to the audience visitng our booth during the event. Part of the Forum was dedicated to the future of mobile gaming and the event invited a variety of speakers to share their thoughts and predictions on this fast-moving industry. Joan Da Silva, Aldebaran’s Content & Design Director, expanded the conference’s focus with a talk entitled: Robots: The Next Big Thing for the Mobile Games Industry? Today Joan is in charge of the Robot Application Publishing but has a 15 year career in designing games for companies like Rovio or Ubisoft. His presentation demonstrated why robots can be the next gaming platform and bring a whole new type of interaction to games as well as explored the opportunies and challenges for game developers. Since not everyone in the audience was familiar with robotics or Aldebaran, Joan made a brief introduction of the nature and characteristics of humanoid robots and how Aldebaran robots were designed to be more than technical devices but also engaging interfaces generating empathy. He then explained the pressure of designing a device predated by Hollywood, science fiction and pop culture. The figure of robot has been described and fantasized for hundreds of years and science fiction has generated a lot of expectations, and these expectations have to be taken into account. Despite almost daily announcements of “breakthroughs in AI”, we are still far from a Human-level artificial intelligence. Designers, animators, and programmers are needed to write the robot interaction rules and create good experiences for users. This is also an amazing challenge which calls for creativity and imagination. Due to their nature, both technological connected devices and popular figures generating empathy, social robots can also be transformed into gaming companions or platforms. Obviously, it is the beginning of this industry. Robots are improving everyday and their abilities in the coming years will be greatly evolved compared to todays. But, as Joan said, no one waited for the PS4 launch to start developing games and build an entire market. It only took a decade for the mobile game industry to emerge. If we focus on phones, we went from basic small games, directly embedded on the device, to a full self-service ecosystem blurring the boundaries between social interaction, gaming and generating billions dollars incomes. It is now time to consider the possibilities offered by new devices like Pepper and start imagining new game possibilities. Joan strives to enlighten the audience why social robots like NAO & Pepper are already a reality for developers and consumers. Also that things are about to expand greatly in 2016 with the arrival of Pepper in Europe and in the US (Yes, you did just read 2016 ). As mentioned by several reports, the coming years shall witness a significant rise to the number of social companion robots. While the Japan Robotics Association estimates the Japanese market size for Personal and Service robots to in the 50 billion dollar range by 2025, Tractica report on Consumer Robotics forecasts that, by 2020, about 4.5 million family robots will be shipped each year worldwide… another big reason to start considering the social robots market as a promising path. In conclusion Joan pointed out the similarity between the robotics and gaming industries. 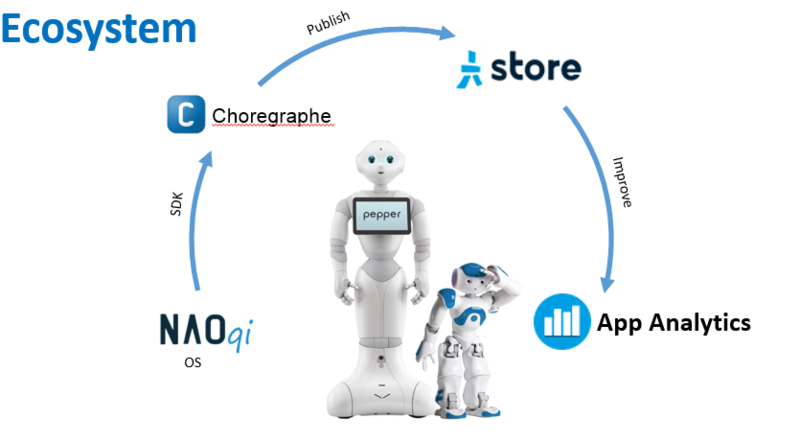 Robots, like Pepper, depend on application ecosystems. As a matter of fact, what makes a good development team for a robotics application is the exact same one than for game development: designer, UX designer, graphic designer, artistic director, interaction designer, animator, testers, dialogue expert. Finally, the existing ecosystem also follows the game development scheme: develop, publish and improve. In robotics as well, metrics gives an understanding of the user behaviors and contribute to better the experience and offer meaningful interactions. The gap between the two worlds is very thin. As we’ve seen, the jobs and expertise are similar. In both cases, it is all about engaging users with interaction through different means. As for mobile phones, robots are improving, allowing us to focus more and more on the experience offered rather than on the current performance. To conclude, Joan demonstrated an application developed by Aldebaran Studio Team: Music Boxes, a music game with Pepper. This app is a glimpse of what could be done with Pepper. Here is a little overview of it. Using the different robot’s sensors, the user is allowed to experiment the game with Pepper in the physical world while interacting with the robot. The experience is empowered by the exchange between the player and Pepper and enhanced by the robot abilities. So, how could we incorporate robots in games? There are different ideas to explore: they could become a gaming companion, playing with you or against you, or even personify and embody the game itself. It is up to us to imagine it.